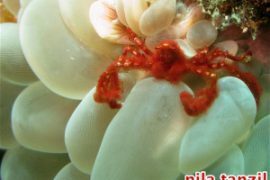 Last month, I was invited by the Indonesia’s Ministry of Tourism to go on a two-week trip around Indonesia together with international travel bloggers. However, since I have a full-time job (yes, I’m a career woman! ), I couldn’t join the whole trip. I could only join the trip in the weekend. According to the schedule, in that weekend, the group was going to Mount Bromo in East Java. Yeay! I got excited because I’ve never got around to visit this beautiful mountain yet! 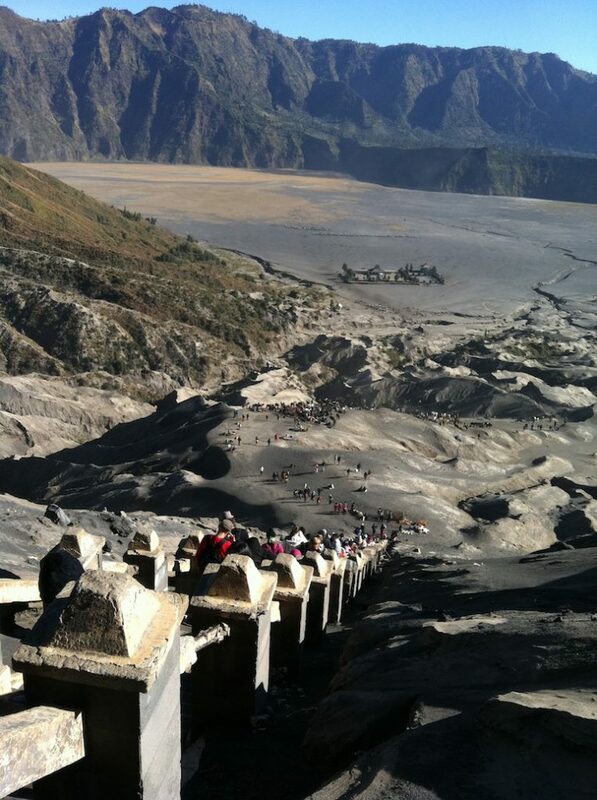 I met with the whole group in Surabaya and from there, we went to Bromo by bus. Of course we stopped for lunch and had tasty Indonesian food first! 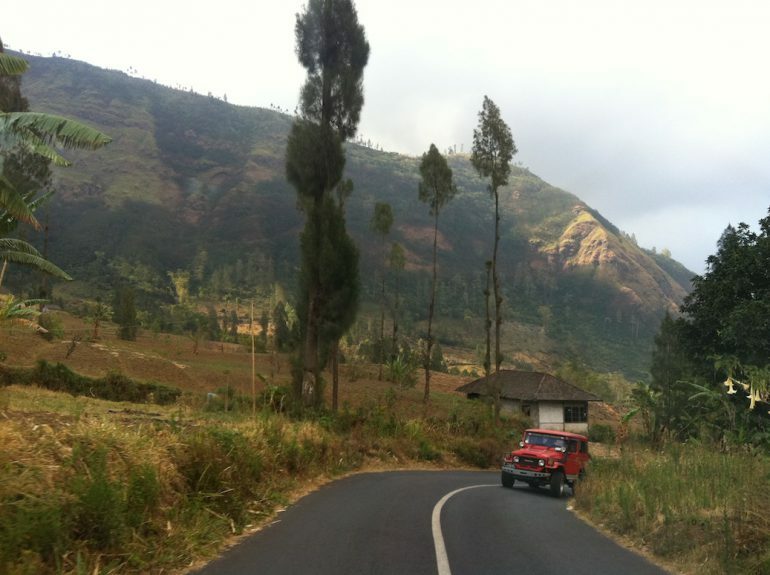 The journey to Bromo took about 3-4 hours by bus and our eyes were spoiled with the beautiful landscape all around. Oh, we also had to change our vehicle to an off-road jeep! Cool! Check out the road on the way to the mountain. That afternoon, we didn’t do much, only exploring the area around the hotel and enjoying the gorgeous scenery around the Java Banana hotel, where we stayed. It was very quiet and peaceful there… I loved it! The next day, we had to wake up extremely early and left the hotel at 3.15am to catch the sunrise at a volcano at Penanjakan. Again, we took the jeep up, continued by a 15-20 minutes walk in the dark. It was pretty chaotic as sometimes we had to walk in between horses! Ha!! 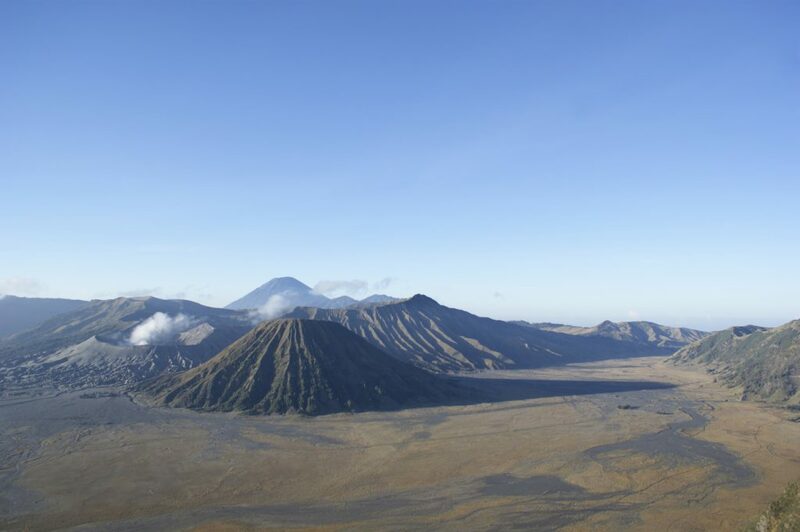 Mount Bromo is famous for its gorgeous sunrise. People say the best sunrise is in Mount Bromo, while the best sunset is in Labuan Bajo, Flores (where my heart is!). So, I was very excited to witness the best sunrise in this country! However, it wasn’t our lucky day. There were big clouds covering the beautiful sun when we were at the top! Ohhh nooooo!!! Anyway, even though we didn’t really witness “the best sunrise” in this country, the scenery was still breathtaking. It was just like in postcards! Any angle you shot, for sure your photo would turn out good! I was glad that finally I came here!! 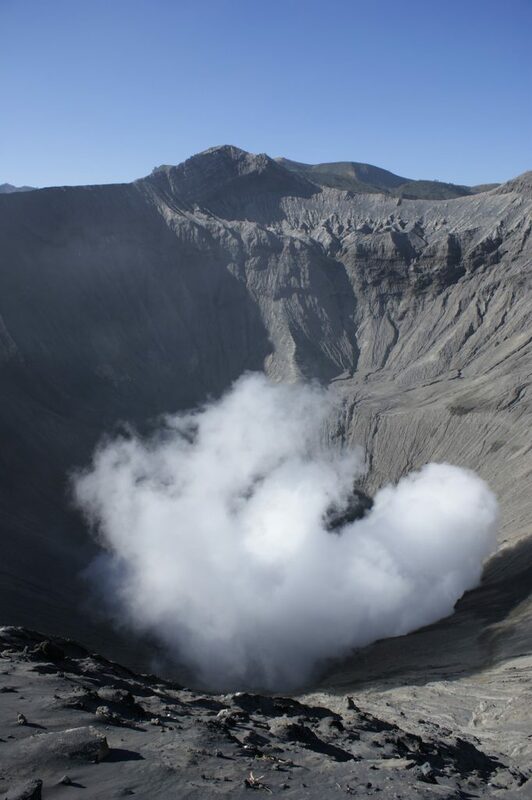 Mount Bromo (2,329 m) is located in the Bromo-Tengger-Semeru National Park, East Java. It’s one of the three volcanoes that emerged from a vast crater. It is easily recognized as the entire top has been blown off and the crater inside is constantly blowing off some smoke, just like a chain-smoker grandfather! 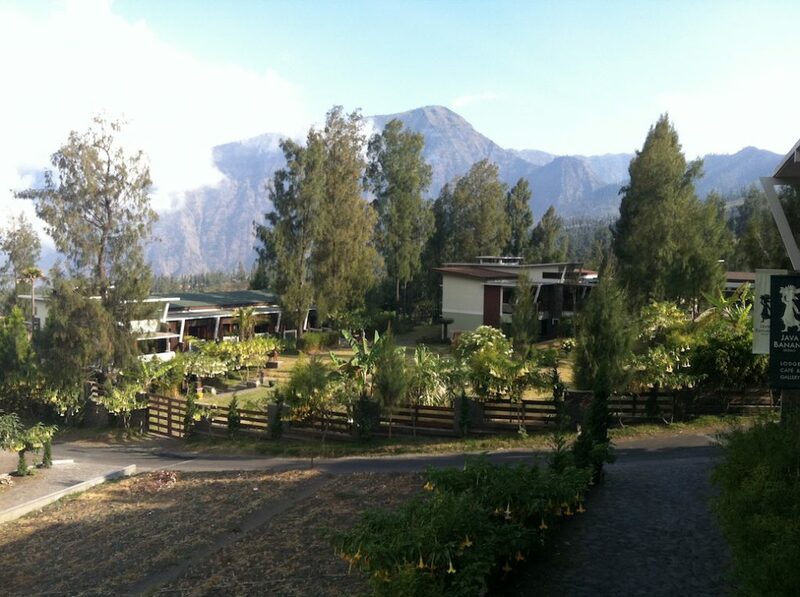 After enjoying the beauty of the mountains, we’re heading to the Mount Bromo itself! We wanted to greet the “chain-smoker grandfather”.. errr.. I meant, the crater! To go there, we had to cross the Sea of Sand. OMG… soooo beautiful! I think this was my favorite part of the trip. I fell in love with the sand dune! It felt like I was in a real dessert… surrounded by huge mountains all around me. So pretty. 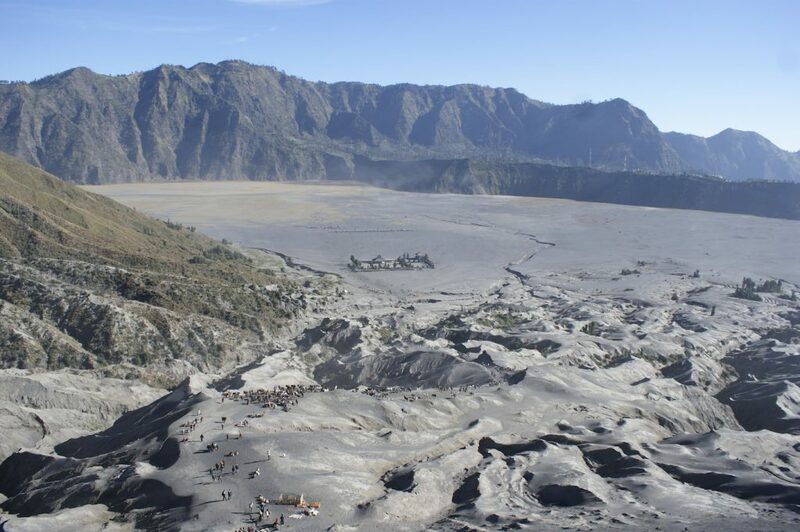 Several things that you need to prepare when you visit Mount Bromo and its crater are: mask, sunglasses, sweater (it can be around 15 degrees) and comfortable shoes. It was very windy and dusty, the sands could get into our eyes easily! 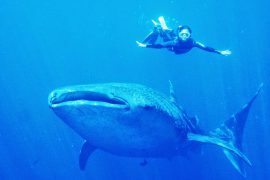 One of us said, “We should’ve brought a goggle next time!” I agreed. Also, don’t forget to cover your camera every time the wind blows. You don’t want your camera to be covered with sands! 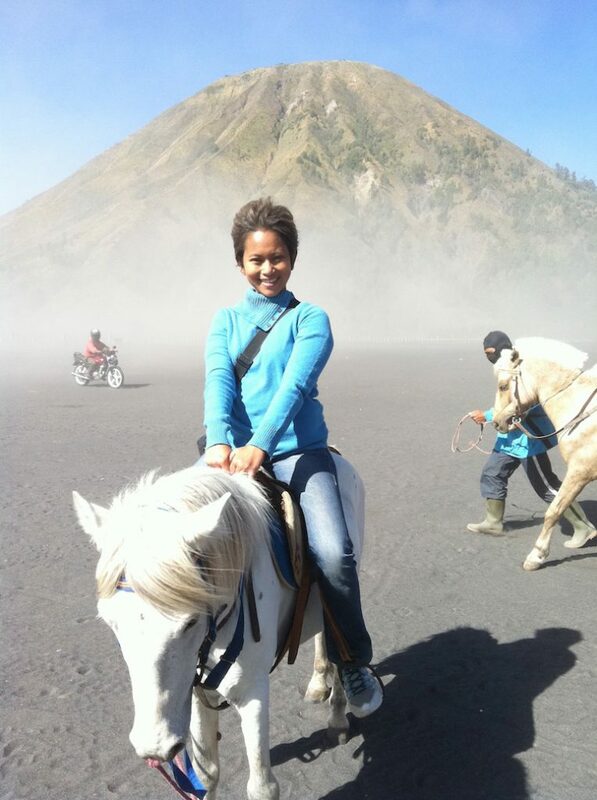 After a fun horse ride, we had to climb 250 stairs to reach the lips of the crater. Yes, it was pretty tiring but the scenery from up there was worthy! Check out the scenery from the crater! On the way back, I crossed the Sea of Sand again with my white horse with a joyful heart! Goodbye unicorn without wings & horns! Till we meet again! 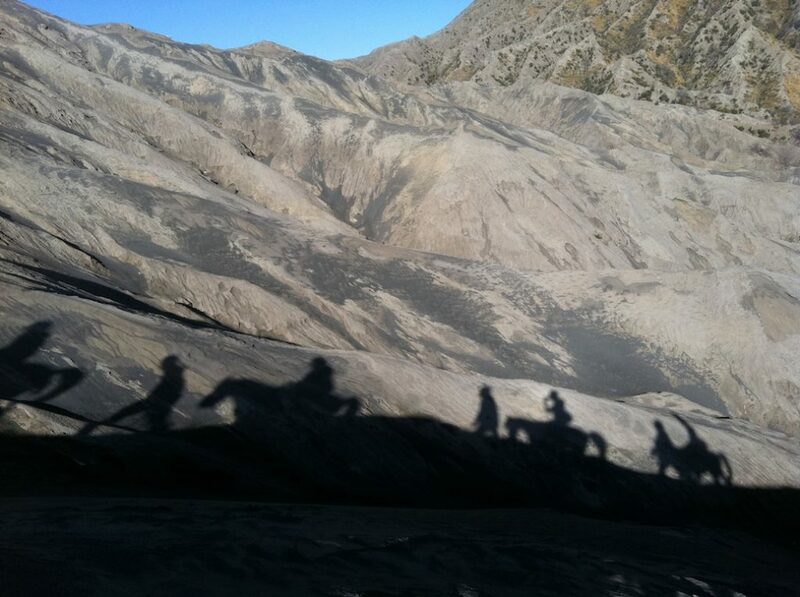 at first, i didn't believe about the sentence that said you've never visited Bromo yet.. but that's not important, the experience we had from that place is very unforgetable.. Nice story and pics mbak. @Bang Jay: cepetan pesen tiket! hahaha.. I'll there mba, on march 29. 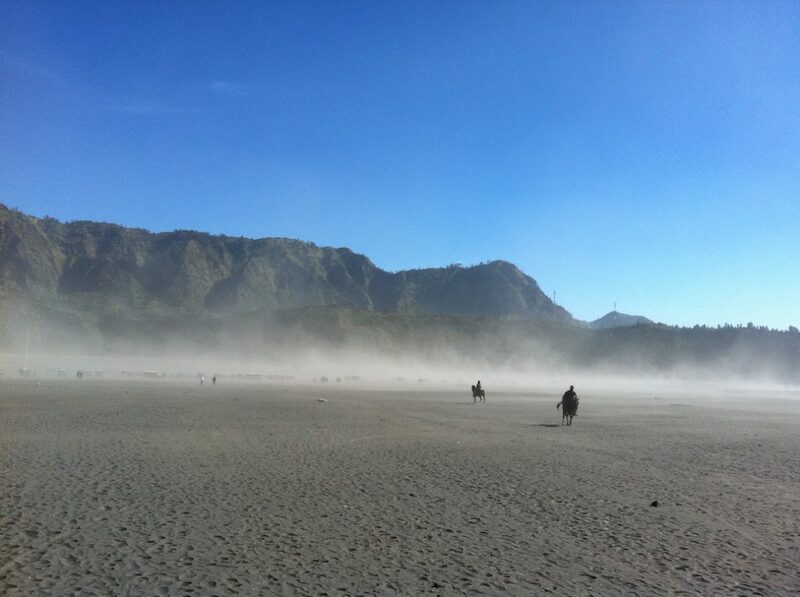 Cant wait to witness the beauty of bromo.